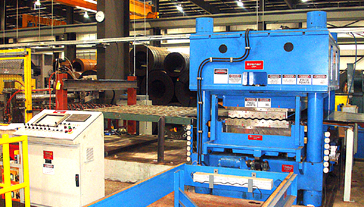 Delta, British Columbia - Cascadia Metals, Ltd, a multi-location coil and sheet service center has completed a major upgrade of its CTL, which included the installation of a Braner/Loopco Hydraulic Cassette Leveler and a 40-foot Automatic Sheet Stacker, at its Delta, BC flagship service center just outside Vancouver, BC. The upgraded CTL has the ability to produce laser flat 72" x 80,000 PSI yield strength sheets in gauges from 5/16" down to 14-gauge. 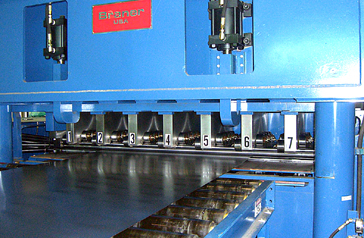 With its new Computer Controlled 300 HP Hydraulic "Plunge" Cassette Leveler, Cascadia Metals can produce panel-flat laser-quality high-strength sheets throughout a wide gauge. 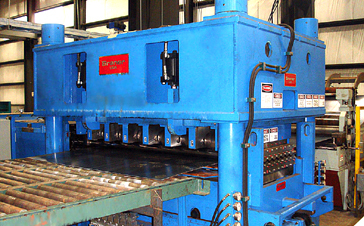 The Cassette Leveler employs 14-independently controlled hydraulic cylinders rather than gearmotors and sliding wedges to position its back-ups and work rolls for shape correction and precision leveling. The 14-cylinders, each fitted with a microprocessor controlled linear voltage transducer, generates enormous work roll plunge forces and precise position accuracy required for laser quality leveling. The 4-post Cassette Leveler frame is engineered for the sturdiness and rigidity necessary for precision leveling high-strength coil. Seventeen roll x 7-flight Leveler Cassettes with work rolls ranging in size from 1.750" to 3.500" can be pushbutton installed into the Cascadia Leveler frame in a matter of a few minutes. Unlike mechanical "screw jack" Levelers, the massive Cassette Leveler crown is firmly fixed onto the four Leveler frame posts for maximum rigidity. Backlash and clearance slop that compromises precise roll positioning in "tilting" mechanical screw jack Leveler crowns are non-existent in Hydraulic Cassette Levelers. Leveler Cassettes contain the work rolls, intermediate rolls, back-up flights, back-up bearings, and all universal drive shafts…essentially all the working Leveler parts, which means all work roll, back-up bearing, and other periodic Leveler maintenance can be accomplished on a work table outside the Leveler frame while the Leveler is producing product with another Cassette. Hydraulic cylinders accurately lock the Cassette in place when running. 4-Hi, 5-Hi, and 6-Hi Cassettes with work rolls ranging from 1.750" to 3.500" can be installed into Cascadia's Cassette Leveler. 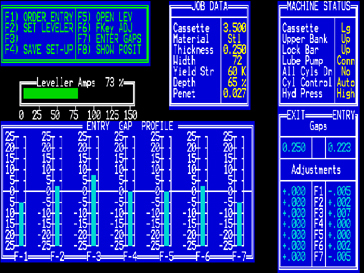 Entry work roll profile screen. First and foremost among the operational benefits of the Hydraulic Cassette Leveler is its ability to establish completely different entry and exit roll bend profiles. Independently controlled cylinders allow the operator to set the Leveler for severe entry roll "bend" and "plunge", while the exit rolls are set parallel and feathered. The ability to independently adjust entry and exit roll bend profiles, not possible with a mechanical screw jack Leveler, produces a flatter sheet.